Over the past three years, Main Street Writers has been conducting writing projects with children in Holyoke. Once one of the wealthiest and most art-rich cities in the nation, Holyoke currently has the lowest average income and the lowest literacy rate in the state.Creative writing is both an art and a tool for change. What makes this medium even more compelling is the connection between writing and literacy. When children experience writing as a way to explore and share their own stories, the excitement, confidence, and skills they develop carry over into classroom learning. Literacy increases – and that impacts learning across all subjects. I’m often at a loss to articulate how hard, and at the same time how rewarding, this work is. My students live with uncertainty about things I take for granted. Still, they come to school wanting to learn every day. Kelly School teachers and administrators are some of the most resourceful and dedicated professionals I have ever met. At the same time, city, state and national policies have a direct impact on the school –for better and for worse. Learning is at stake for some of our most vulnerable children, and there are no simple answers. So I write. I journal and ponder and consider, and then I plan for the next day’s groups. Writing helps me balance the complexity of forces that affect my work with children on a daily basis. 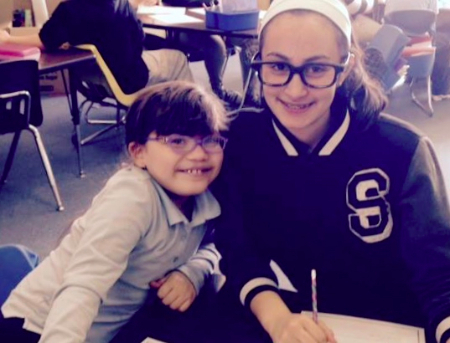 Older students pair up with younger ones to build literacy skills.